The Culinary Curiosity exhibition at Kendall College is a celebration of technical innovation in the world of food. 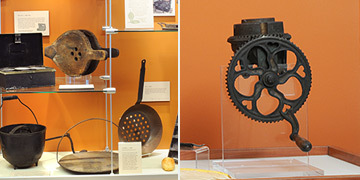 Woven throughout the school are stand-alone displays of culinary tools drawn from the personal collections of food industry veterans, Mel and Janet Mickevic. More than 250 objects are organized in the displays according to food preparation techniques—mixing, roasting, forming, and so on. They are interpreted to reveal technological innovations. By selecting the Virtual Exhibit menu, visitors can browse key artifacts from 12 displays. Slide over the images of objects to zoom into details. 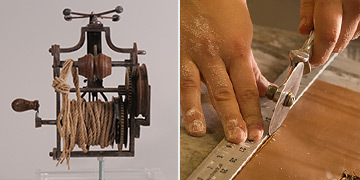 Tools in the collection represent varied approaches to challenges in culinary work. By choosing from this menu, visitors see examples of innovative solutions in 17 food preparation techniques. Examine details of the artifacts by sliding across the images.